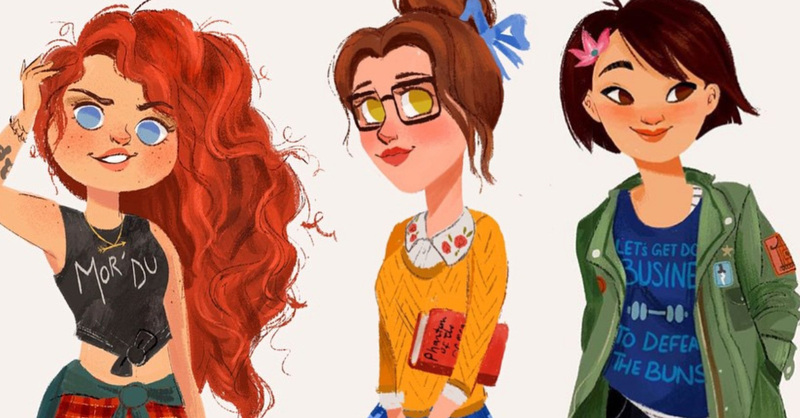 Your favourite Disney Princesses were reimagined as millennials and you might be one of them. Canadian artist, Anoosha Syed, has created a series of comics modernising Disney Princesses like Jasmine, Belle, Tiana, and many others. They’ve got traits that you no doubt have seen in your friends, maybe even in yourself. Her artwork is loved by many with almost 60K followers on her Instagram, and she posts frequently, multiple times a week. Give her some love! #1 Princess Jasmine – The hipster boho chic. #2 Princess Belle – Loves books and runs her own blog. #3 Princess Tiana – Fashionable and focused on her career. #4 Snow White – Social media guru and loved by many. #5 Mulan – Edgy activist who posts thought provoking articles on Facbeook. #6 Pocahontas – The mom friend that everyone asks for advice. #7 Princess Ariel – The ditzy friend you can count on for fun. #8 Princess Merida – The tomboy punk rock chick. #9 Esmerelda – The gorgeous friend everyone thinks models, who’s super cool artistically like it’s nothing and probably speaks more than one language. Previous PostPrevious A Live-Action “Kim Possible” Movie Is In The Works!